Perspective - Precision Solutions, Inc. Okay, I’ll admit it. I’m a huge fan of the Denver Broncos. Each year about this time the house gets decked out in orange and blue, the flags of all shapes and sizes come out, the wife gets crazy, and it’s ON. It’s not autumn. It’s not football season. It’s Broncos Season. 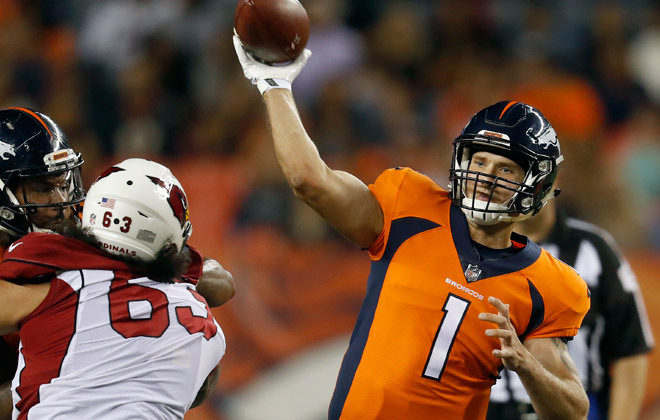 In the last preseason game against the Arizona Cardinals, Kyle Sloter started at QB for the Broncos. The final score of 30-2 in favor of our beloved Broncos was an awesome showing for a kid that isn’t yet promised a roster spot on the team this year. But what’s interesting is that Kyle Sloter scored every point of that game – even the 2 points for the Cardinals. In their first possession, the Broncos got backed up against the goal line and Kyle went down in the end zone for a safety. Score 2 for the Cards. Yes, their defense was instrumental in those points, but Kyle could have thrown the ball away and prevented the points. But he didn’t. He protected the ball at the cost of the points. This story could be about Kyle Sloter in his first NFL start, first NFL possession, being sacked for a safety and becoming a footnote in NFL history. But it’s not. Through the remainder of the game, Mr. Sloter then led the Broncos to 30 more points. That, I believe, is the better story. Another great Broncos player named John Elway remains one of the few NFL QB’s to accidentally line up behind the wrong player. Yet, he went on to a career with two Super Bowl championships and is now the team’s President of Football Operations. One might say Mr. Elway has done well for himself after this little gaffe in NFL history. Whether Kyle Sloter makes the current team is yet to be seen, but his performance showed he would not be defined by a setback. Rather, he brushed it off and then got back to work, leading the Broncos to an impressive win.